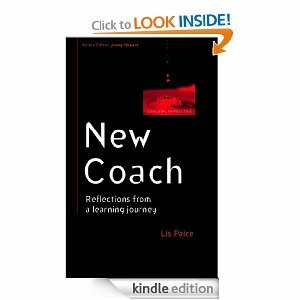 I just finished reading "New Coach" by Lis Paice, at http://amzn.to/V7AnNn on Amazon. It gets 7,000 hits on Google, so the publisher, the Open University in the UK, is doing a good job of promoting it there. But so far not apparently in the USA. I just wrote the first review on the U.S. Amazon site. Yet I would argue that the book is needed much more on this side of the Atlantic than it is in the UK. Medical care costs are eating the USA alive – it is the most worrisome part of the Federal Budget. Medical cost increases are ultimately the only convincing target of the mindless "sequester" by House Republicans. We have some time to deal with rising medical care costs, and the ruat caelum approach of fiscal ideologues is flirting with destroying America's recovery, in which the rest of the world has a big stake. The book is written by the former Dean of Postgraduate Medical Education for London, Dr. Elisabeth Paice, OBE ("Lis Paice" is her coaching name). After 16 years in her job overseeing the clinical training in the London hospitals of British medical schools, she retired to become a personal coach. This book is a record of her early years as a coach trainee inside the National Health Service – what she learned about herself, about her anonymous clients and people in general. The book has broader significance than the author claims. The United States has a medical care system that functions well for the 1 percent, and attracts wealthy people from overseas to get high-quality high-cost care, but does not work so well for the 99 percent. The United States ranks at the top (#2 after East Timor) in how much the public spends on health care (18.2% of GDP, vs. more like 10% in most OECD countries), but ranks 37th among U.N. members in overall measures of health outcomes. The UK ranks at the top, with the Netherlands and Australia, on outcomes. The difference is not just the single-payer approach of the NHS, since a country like France does almost as well while relying on private businesses for health care delivery. The key to running a medical care service with full coverage at half the cost of the the United States, with better outcomes, seems to be the NHS reliance on teams instead of super-doctors. Building teams that function efficiently and effectively on behalf of the patients is a major challenge of the National Health Service, to the point that mentoring is a key NHS program. Dr. Paice was named the NHS "Mentor of the Year" in 2010, so her peers think she is pretty good at this team-building exercise. A coach is a kind of mentor, but as the author of "New Coach" makes clear, a key difference is that a coach is an equal, whereas a mentor is a parental figure. It was important for the King's coach in "The King's Speech" to call the king "Bertie" - thereby establishing a relationship or equality. A coach and her client may share the same encounter, but they do not share the same experience. The experience for clients should be one of talking about their past, present and future. The role of the coach is to ask questions, to summarize what the client says periodically, and to provide facts when useful. The coach may also provide some sympathetic or congratulatory comments, but in a non-directing way. What the coach must not do is talk about herself, or try to "rescue" clients by intervening on their behalf. One of the book's most instructive stories - and, indeed, this is as much a book of morality tales as any collection of Hans Christian Andersen,the Brothers Grimm or Jean de LaFontaine - is about a failed coaching experience. The client was having a problem at work and Dr. Paice solved it with a couple of phone calls in the presence of her client. The client was grateful but never came back. Takeaway: The coach's job is not to solve problems; it is to inspire clients to solve their own problems. I have heard people say that pessimists are happier than optimists - because things usually turn out better than they had expected - but it has not been my experience. Eeyore was not a happy donkey. At another point, Dr. Paice tells the story of an early session with the leader of the NHS coaching course. Each of the trainees was to listen to the problems of the other and offer advice. Each of the eight people in the course said they thought they had given very good advice but unfortunately they didn't get good advice. In other words, people like giving advice and they hate getting it. This is another reason why coaches are proscribed from offering advice. - Are thinking of becoming coaches. - Are thinking they might make good use of a coach. - Are sure they have no need of a coach. When Obamacare gets to the point where the medical establishment realizes that it needs to move from the Famous Doctor concept to a team approach, it will surely catch up to the NHS in discovering the importance of teams. When that happens, sooner the better, Lis Paice's book could be one of the Gospels for a new approach to medical care. Most business coaches and executive coaches believe that they are ethical. However, this story truly reveals some hidden agendas for some who are business coaches or executive coaches. Do you mean the hidden agenda of trying to improve service to patients and reduce costs? Eeyore was certainly not a happy donkey. I have to disagree in some respect though, natural pessimists might never see the light but lowering your expectations relative to the context can yield good results. I have sessions with The Lifestylist every week and although she encourages me to aim for the stars, she tells me to expect the moon. 2. Advisees are far more influenced by indicative facts than by opinions.